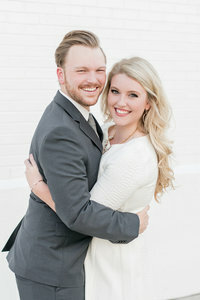 We met Ricky and Susanna in downtown Birmingham at Railroad Park for their engagement session. It was an October morning, and Railroad Park was absolutely empty. That’s a rarity for us. We are so used to dodging joggers and editing out the skateboarders from the back of our photos! During this session, we had the park all to ourselves! We think it was partly because it was 8:00 a.m. and partly because it was the first freeze of the year. It had been so warm, and then all of the sudden, it was unseasonably frigid! We even stopped for coffee and hot chocolate and took a few heater breaks in the car. It was that cold! When you look through these images, you’ll see Susanna and Ricky’s sweet laughter, but hopefully you won’t see their shivers! Susanna was a pro at hiding how cold she was in her cute dress, and Ricky was a pro at holding her tight and keeping her warm! Ricky and Susanna are getting married at Riverchase United Methodist Church and celebrating at Riverchase Country Club with the help of M. Elizabeth Events. It’s going to be a beautiful day! We’re so excited to get this show on the road!